Over the first ten months or so of rock ‘n’ roll’s lifespan there was no act flying higher than The Ravens. Their radical re-working of the entire vocal group approach, placing bass voice Jimmy Ricks out front and letting him inject all sorts of unspoken sensuous undertones into songs, was transformative. Not only did it alter the sonic textures of the material but it upended the manner in which these songs were thought of by audiences. Pop music had long done everything in their power to either mask any racy attributes in songs by presenting them in a neutered fashion, oblivious to their deeper meanings, or else they treated the suggestiveness as a harmless joke, something to laugh about, not be taken literally. Crooners ruled the day and though they frequently sang of love it was most often with a yearning unfulfilled quality that kept them perpetually outside the bedroom door. One reason instrumental jazz music had thrived for so long was because it was an outlet for the pent up horniness that wasn’t allowed to be expressed in vocal records, but now in the late 1940’s even mainstream jazz was becoming excessively mannered. In other words, the dominant music of the era was asexual in nature… until rock ‘n’ roll came along in 1947 and changed that overnight. The Ravens by virtue of their unique construction couldn’t very well be mistaken for anybody else and rather than let Ricks and his sonorous voice be promoted as a mere gimmick they crafted material to fully take advantage of his greatest attribute, then set it off even further by having stratospheric tenor Maithe Marshall act as a shocking contrast to him in their records. The group wrote much of its own material and placed their music squarely within the rock realm by focusing on topics that were decidedly off-limits to more sedate pop. Even if parsing the lyrics might not reveal anything untoward, the way in which they were written for Ricks to deliver them ensured that nobody would need subtitles to understand what they were really about. Everything was lined up for them to reign unchallenged for years. They’d had more than a year’s head start to hone their skills before rock came along and provided the perfect outlet for their brand of racy music. 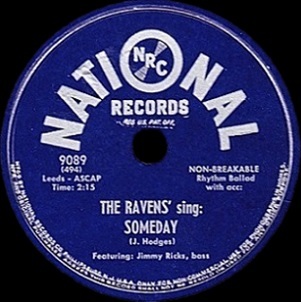 They promptly scored a series of major hits that helped to establish the commercial viability of the entire genre and by the time The Orioles came along in the summer of 1948 as their first serious rivals in the vocal group field, The Ravens were so well known and so distinctive that they could hardly have been mistaken for one another, so different was their approach. Naturally that’s when they set about trying their damnedest to sound more like everybody else. Though it should’ve been absolutely no interest to us, or certainly to any rock act of the day, Vaughn Monroe was currently riding high on the pop charts with Someday and as we’ve stated plenty of times the trend in music in this era was for rising songs to be covered by anyone and everyone seeking a hit. Though penned five years earlier by Jimmie Hodges it had been revived this past summer and took off and by early September there were eleven versions of the song being advertised by artists large and small. Now you can make that twelve. If this had been The Ravens lone foray into this practice, maybe sensing it was a song they could really do wonders with by inventively rearranging it, then you might give them a pass. But over the past year this was becoming habit for them, as if their sights were no longer set on simply appealing to the rock crowd but increasingly were targeting the older gentry who’d just as soon toss all of rock ‘n’ roll out with yesterday’s newspapers. The effects of their courting two vastly different constituencies was becoming all too apparent, though the group themselves and their label seemed almost oblivious to it. Their biggest hits had come when they were aligning themselves strongest with rock listeners while they were now only scoring minor regional hits with their pop leaning material. That’s not the way career arcs were supposed to unfold. Usually you’d start off with only limited sales in certain areas before breaking out nationally, after which you had a reasonable amount of time to court the widest audience before time and changing tastes took its toll and a few years later you’d fade from view like everyone else. But The Ravens seemed to be inverting that process, trading the bigger fan base for a limited one, albeit with more mainstream cachet. Maybe like so many music industry insiders raised in old school thinking, they viewed this as the best bet for long term success. A way to ensure they’d have access into the types of classier clubs that could be expected to sustain their careers long after the hits dried up. If so it was a gross miscalculation. Not only was the older demographic less passionate about music in general than the kids whose support had propelled The Ravens to stardom, but in a few years those same kids would comprise the adult audience they were expecting to pull in now and yet if those fans felt they’d been abandoned by the group when they’d lived and died with each new release when they were younger then it was hard to see how they’d come back around after being jilted. All of that however is the big picture view of the changing musical landscape they were immersed in. The smaller picture coming into focus today was this specific record and how IT might appeal to somebody… anybody… with a dollar to spare who presumably wouldn’t be as interested in The Ravens had they stuck to originals. As a pure song ripe for the picking Someday (You’ll Want Me To Want You) at least had plenty going for it that made covering it worth the effort. It had a delectable melody, a strong story-line and some really good lyrics to tie it all together. 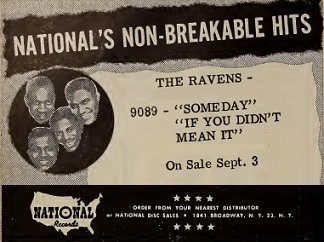 The Ravens may have been the first rock vocal group to take a stab at it but they wouldn’t be the last, as The Drifters with Clyde McPhatter turned in a particularly memorable performance of the song down the road. The difference of course is not just the five year time lapse between their efforts which cast the song in a different light when The Drifters tackled it, but more importantly the respective groups’ intent by singing such a song. In The Drifters case it was one of the few times they attempted to mine a pop standard outside of Christmas fare, thereby making it a unique wrinkle in their usual output of racy originals. Since by that time the composition itself was a full decade old it had acquired a reputation as an established standard safe for reinterpretation. A lot of artists had done so by then and would continue doing so for years to come, among them such rock acts as Sam Cooke, Ricky Nelson and Ray Charles, the latter tackling it in a country vein which is actually where it had first started making noise with Elton Britt’s #2 country smash in 1946 establishing the song to begin with. By contrast The Ravens were very clearly hopping on a bandwagon as the song was undergoing a revival in 1949 with not just Vaughn Monroe who’d score the biggest hit with it (two weeks at #1) but The Mills Brothers were also on their way to scoring a Top Five hit with the song. So The Ravens version, no matter how well they might do it, had the appearance of opportunism which is never good for an artist’s image in rock ‘n’ roll where originality was valued above almost anything else. Yet The Ravens by virtue of their distinctive style could negate the stigma of covering popular songs as long as they took it well away from the blueprint others had already laid out. When listened to in that context, comparing it not just to Monroe and The Mills Brothers, but also the likes of Henry Babbitt, The Ray Bloch Orchestra, Gene Autry, and even old friends The Four Tunes who cut a version of it that was pretty desultory, The Ravens had a wide open field for completely re-interpreting it if they so chose. Compared to all of those takes on it The Ravens definitely stand out. Following a somewhat stilted harmonized intro by the group which nevertheless sets it apart, Jimmy Ricks comes into the picture with his effortlessly rolling bass voice sounding a little tame actually at first before he picks things up a little as he goes along. Naturally, this being a Ravens record, we need a Maithe Marshall interlude and it comes right on cue after a particularly stale piano solo. Though as was his wont Marshall flirts with parody at times, his voice soaring with an open throated artificiality, the other Ravens wind up shaking things up with their counterpoint lyrics in the background, alternately demure and reverential – though as always with them sung well – before trading off with Maithe, switching roles and added much needed emphasis on the rougher, dare we say hipper, textures of their voices. If nothing else it shows that as singers these guys still could knock the blocks off anybody in the business… if only they weren’t reining themselves in all the time. Which leads us back to the unfortunate lack of ambition they show in their overall approach. Though their take on Someday is indeed light years ahead of the pop or country renditions that they were competing with, toying with the melody enough to give it some rhythm, getting reasonably creative in their vocal arrangement, the fact is, despite what they themselves might think, they were NOT competing with those versions at all. Not for the same audience anyway. They were competing with the rock releases currently out… the latest records by the likes of Andrew Tibbs, Little Willie Littlefield and Goree Carter not to mention newcomers like Billy Wright, Charlie Singleton and Mr. Google Eyes, all kids a few years younger than The Ravens, who need we remind you weren’t exactly ancient. But age in rock ‘n’ roll isn’t simply about birth-dates as much as it is a matter of outlook and increasingly it will be those up and coming kids who will be the ones looking to wrest control away from their elders and shape rock ‘n’ roll to meet their own vision as they go on. Once they grab hold of the wheel and start to steer it in a new direction the more established acts will have to step up their game just to keep up. When judged in THAT context this record doesn’t do nearly as well. Aside from the questionable origins of the source material – or rather the thinking that there was a need to look elsewhere for songs – there’s still the inherent compromised intent of trying to draw the curious interest of an older brand of listener and pique their interest by presenting the song as something unusual without it crossing TOO far into radical territory. Listen to Howard Biggs’ florid piano and keep in mind that if you were serious about playing piano in rock ‘n’ roll then you sure as hell shouldn’t play with only your fingers being flexed while your wrists are held so firm that people think they must be in plaster casts from some unfortunate accident. Had he let rip with a quick boogie progression then it’d have shown that they were thinking far outside the box of what was expected from them and it would’ve given this a vitality it’s otherwise lacking. Or how about the usually unassailable Ricks who eases back on the suggestiveness of his singing just enough to not upset any guardians of good taste who’d react with wide-eyed horror if he instead made clear what this unnamed girl he’s delivering the song to could expect from him should she respond to his offer. Had he injected this with an element of lecherous undercurrent, maybe even with the other Ravens screaming and shouting encouragement, it’d have transformed the song’s entire attitude. The story would still be the same of course, that of a guy who is dejected after realizing a girl he likes has no interest in him, but instead of accepting that rejection and the accompanying powerless feeling it elicits, The Ravens could’ve upended it by taking control of the situation and turning the tables on the girl by not only SAYING she’ll want him someday, but showing WHY she will and trusting that their powers of persuasion, or rather the sexual potency they’d project, would win her over. That’d be something that would be well worth examining and would fit in perfectly with the rock attitude for self-empowerment, something which would also connect it more with anyone in the age demographic rock appeals to most. After all, what teenager or young twenty-something doesn’t feel they can alter fate by sheer determination alone? Instead, while Someday remains a catchy song that is sung with The Ravens usual distinguishing vocal characteristics and some clever arranging tricks, it’s deprived of the specific social perspective needed to make it their own. Another missed opportunity by a group who were increasingly taking their status for granted. Yeah, this one’s more than a little stilted. Jimmy should’ve sounded all kinds of salacious on this one, like on Ol’ Man River. But, they regrettably held back here. It’s a crying shame. Additionally, I listened to some of the other versions of this number. For my money, the Mills Brothers, the Drifters (I love their harmony on the “although you don’t want me now” section), and Patsy Cline waxed the best versions (pop, rock, and country). Side-note: Vaughn Monroe is a weird subject for me. I think his operatic, melodramatically reverberating bass-baritone is one of more riduculous things I’ve ever heard… and yet I still kinda like his singing. I don’t what this means. Tall, dark and ridiculous… what every aspiring singing star hopes to be! I don’t know how many people are checking out the Monthly Overviews but each one starts off by showcasing a concurrently huge hit from another genre in attempt to put the rock songs we’re reviewing that month into better historical context. Vaughn Monroe has already gotten three of his songs spotlighted – October 1947, January 1948 and May 1949 – which shows how huge of a star he was at the time. If anyone doubts how radical some of these early rock tracks were at the time you only need to listen to Vaughn Monroe to start to make sense of it all. Leave a reply on "The Ravens: “Someday”"